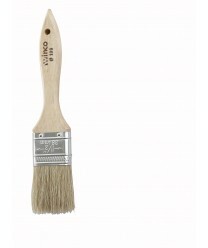 The Winco WBR-15 Flat Pastry Brush 1-1/2" Wide looks like a paint brush and can be used in much the same way to coat breads, rolls and pastries or to baste or spread marinade on meat. This pastry brush sports a 4-3/4" wooden handle with a metal ferrule that prevents bacteria and holds the bristles firmly in place. The natural boar hair bristles absorb liquid well, so that egg wash, oil or water can be glazed onto your pastries with a few smooth strokes. These bristles also do a fine job of soaking up meat juices from the pan so they can be spread over the meat for basting. Versatile and useful, this pastry brush is hand washable and features a hole at the end for hanging.